A place where a variety of colors come together. 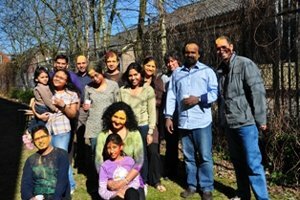 On 20 March 2011, the Indian students of Faculty ITC celebrated the traditional festival of Holi at the student residences 'Plein van Arke'. The festival has religious significance to the Hindu religion, but it has a greater significance to all Indians (and many Nepali Sri Lankans, Surinamese etc) – it heralds the arrival of spring. It is a day of joy, camaraderie, good food and fun. Pleasurably, this year it also coincided with the arrival of spring in Enschede, so the students, their families, and visitors enjoyed the festival with true gusto!